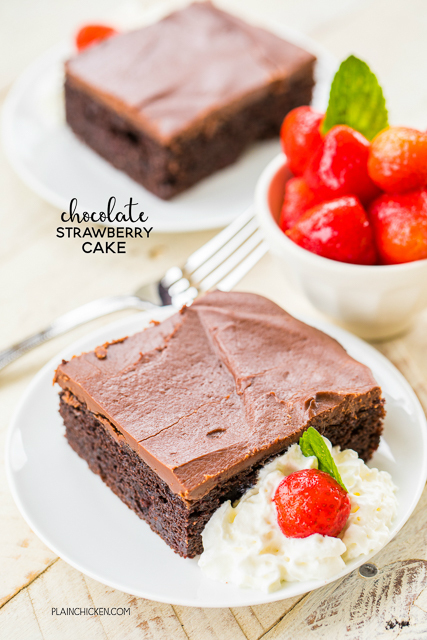 Chocolate cake mix and strawberry pie filling combine to make one amazing dessert!!! 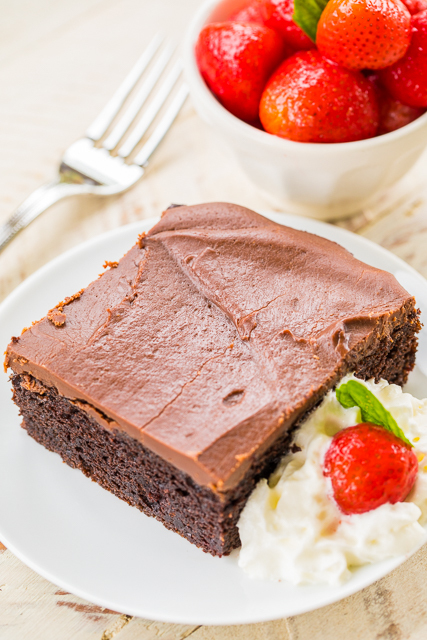 Top the cake with a quick homemade chocolate frosting. This cake is the most requested cake I make! I have to bring it to all of the potlucks I'm invited to. It is always the first dessert to go and everyone asks for the recipe! Make it today! What happens when you combine cake mix and strawberry pie filling? It makes the most AMAZING cake EVER!!! 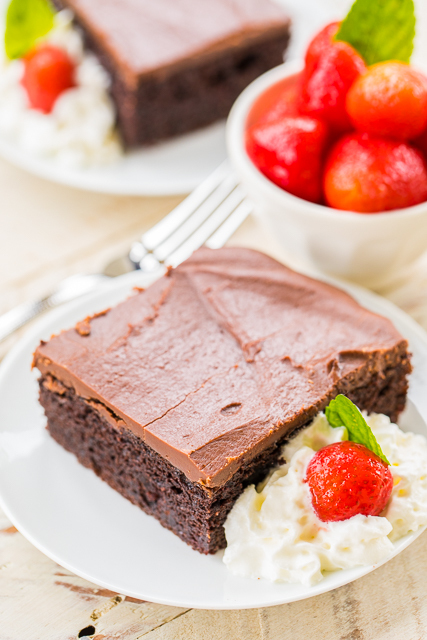 Top the cake with a quick homemade chocolate frosting and you have gone to dessert heaven! I made this cake for a dinner party and it was gone in a flash! Everyone LOVED it and asked for the recipe. They couldn't believe how easy it was to make. It literally takes longer for my oven to preheat than to whip up this delicious cake! I used a hand-held mixer to mix up the cake batter. Using a mixer will break up the strawberries in the pie filing. If you want bigger chunks of strawberries in the cake, mix the cake batter by hand. The cake can be made a day or two in advance and stored in an air-tight container. I just pop the lid on top of my pyrex glass baking dish and it is good to go. Serve the cake with some whipped cream or vanilla ice cream and fresh strawberries. So easy and delicious! Preheat oven to 350. Grease a 9×13 inch pan. Set aside. In a large bowl, combine cake mix, pie filling, vanilla extract, eggs and milk. Mix with an electric mixer just until combined. Pour batter into prepared pan. Bake for 25-30 minutes or until toothpick inserted in center comes out clean. Cool. In a small saucepan, combine sugar, butter, and milk. Bring to a boil. Continue boiling for 2 minutes, stirring constantly. Remove pan from heat and stir in chocolate chips until smooth. Immediately pour over cooled cake. Cool completely before slicing and serving. Yes! Cannot wait to make. What brand of cake mix do you use? Pudding in the mix or no? I used Duncan Hines. It didn't have pudding in the mix. Enjoy! Yummy!! For the frosting, did you use granular sugar or powdered sugar? This sounds yummy! I would think it would work well with cherry pie filling too. I haven't made this in a Bundt pan. I've only made it in a 9x13-inch pan.